Tongs - Brutality to snakes! Call to outlaw the use of Tongs for catching and handling deadly snakes. 488 Park Road, Park Orchards, Victoria, 3114, Australia. Originally Published in hard copy in the Bulletin of the Chicago Herpetological Society 42(6)(June 2007):92-95. While what follows is from the perspective of an Australian herpetologist, most of the issues canvassed apply equally to the North American herpetology scene. Hence it is of importance to readers of the Bulletin of the Chicago Herpetological Society. To start off, I’ve been in the reptile game for about 4 decades. Unlike certain others who make such claims, my history is easily verifiable from licence documents with the NSW National Parks and Wildlife service dating back to 1973 (when licences first started) and news clips pre-dating this, including on ABC TV news (1972/3) and international news bulletins, syndicated through Movietone News. News clips from newspapers from 1977 and later show me keeping deadly Death Adders and other elapids, although my licence documents from 1973/4 also show me keeping elapids back then. Besides news media clips continually in the period 1972-2007 showing my involvement with venomous and other reptiles, my first paper in a peer-reviewed scientific journal was in 1980, and many have appeared on a yearly basis since then. The first two papers I published dealt specifically with my experiences and capturing of deadly and venomous snakes. In 1978, I became the first licenced person in Australia with a licence specifically issued for the purposes of removing snakes from houses (we call them “controller’s in Victoria). At the time (1978), there was no such licence, so the NSW NPWS used a “general licence” form and crossed out sections and inserted relevant bits to fit this previously unheard of licence. Before then, the rule in Australia was effectively, “A good snake is a dead snake”. Now in theory snakes are “protected” by law, which in theory means they shouldn’t be killed. As a result people are now called to remove “nuisance snakes”, and across Australia a new breed of snake catchers has emerged. These people have licences to catch, transport and release snakes perceived to be a threat to persons in built up areas, farm houses, mines and other areas snakes and people meet. For most of the period 1970’s to present (2007), snake catchers have used a variety of methods to catch and handle deadly snakes. While hooks are commonly as an aid for handling captive snakes, wild snakes tend to jump off them, so the handling methods of choice have been “tailing”, pinning (then head grabbing), or variations thereof. Now in theory the best way to “tail” a wild snake is anterior to the cloacal opening and wriggle it continually until bagged or boxed, the idea being to stop it jumping up and biting your hand. The best way to “head grab” a snake is actually by the neck and back of head, but I am sure most people reading this have an idea as to what I am talking about. Sure some people got bitten by snakes, but that was usually a result of either a lack of experience, lack of training, a wrong attitude, or a combination of these, rather than any fundamental fault with these well-tested handling methods. Put another way, in four decades of catching thousands of snakes, including the world’s four deadliest genera, overseas taxa like Rattlesnakes and so on, I’ve never had a serious bite from a snake (serious defined as death or anti-venom). Pretty much all the bites I’ve had have been in the genre of “mildly venomous” taxa “free-handled (mid body), on the basis of welfare considerations for the snake, rather than a forcible prevention of the snake from biting. While most snakes free-handled from the wild won’t rush to bite, many do, and that’s a risk I have taken countless times with mildly venomous taxa and as a result also had many (non-threatening) bites. In the captive realm, we offer dead (and sometimes live) mice to snakes to eat. This is one time all snakes will bite … when they eat. Because snakes aren’t always accurate, they may sometimes inadvertently bite the hand that feeds them. That’s where the use of tongs helps. If the snake bites the “hand” it is the tongs instead . If feeding deadly taxa like Tiger Snakes, this may mean the difference between life and death. Because of the obvious common sense of tongs in these situations, tongs of some sort are now seen in use in almost every reptile keeping facility, including my own. These may include the likes of barbeque tongs, giant tweezers, forceps and so on. In 2002 we were approached by a West Australian film company, Prospero to give permission to use the trademark “Snakebusters” for a series of so-called “documentaries” they were planning. We declined until we were provided a proper submission and as one was never given, the company was told not to use the trademark , a stand they were told from our first correspondence. The shows, screened as “The Snakebuster” on various cable networks, became the subject of litigation and in court it was shown that a snake handler by the name of Bruce George had committed cruelty to snakes by using “tongs” to handle them. Ultimately the film company and agents had to pay us $39,500 in a court approved settlement (at end 2005). Four separate legal actions by Prospero to have my snakebuster/s trademarks quashed all failed and we therefore retain all. This particular program was the first time I had ever seen tongs used to handle deadly snakes. On a smooth surface (where the tongs work best) the metal grip crushes the snake’s ribs (leading to what will almost certainly be fatal injury). This outcome invariably occurs whenever tongs are used. The snakes writhe in obvious and measurable pain, making the use of tongs on snakes one of the cruellest acts conceivably inflicted by a so-called “herpetologist”. On that basis I am shocked that reptile lovers around the world haven’t been up in arms about this. At the time (2004-5), I thought that the use of tongs by Bruce George and others in those shows was a “one-off”, but this was not to be the case. Following my complaints about this cruelty, a coalition of so-called “Hoser haters” automatically opposed my stance against the use of tongs. This group, including David Williams (currently of north Queensland and New Guinea), have been adversely named in Hoser books and nowadays use the internet and other forums to automatically oppose anything I say and do, no matter how idiotic their opposition is. If for example I argued Australia was in the southern hemisphere, Williams and others would SPAM the world and tell them I’m wrong and that it’s in the northern hemisphere. Such is what happened with the tongs. Before I posted against tongs, Williams was also against them. At this level he was right. Yes common sense prevailed. That was in November 2003. After it became clear that I (Raymond Hoser) was also against Tongs, Williams, with no morals or scruples, reversed his tune and began posting about the virtues of tongs as part of his broad-based attack on anything “Hoser”. (Williams did the same about face with venomoids, in 2003 posting on the internet about his own failed venomoid operation on a Taipan and then becoming staunchly anti-venomoid after I published details of Australia’s first successful operations). Williams posted on lots of internet forums (e.g. venomdoc.com, aussiereptilekeeper and aussiepythons), including about his newly found virtues of tongs. Williams always asserts “authority” with a signature file aligning himself with a major institution such as a university, to attempt to give his views more credibility, the result being that impressionable novices fall for his ruse and may end up doing as he tells. This is exactly what has happened with the use of tongs, although in fairness to Williams he cannot single-handedly be totally blamed for their increased usage. Another of the “anti-Hoser’s” Mark O’Shea of the UK, has even set himself up as the face of a USA-based tongs company, showing himself using tongs to handle deadly snakes, effectively inviting others to emulate him. The emulation invitation has worked here in Australia (see Gladtone Queensland reference at the foot of this article). Here in Victoria, a novice snake handler, Simon Watharow (claiming 10 years in the reptile game) and his disciple, Sean McCarthy, now running the so-called “snakehandler” business, have also been using tongs to handle deadly snakes. McCarthy has pictures of this use of tongs on his site (snakehandler dot com dot au), and the suffering of the Tiger Snake victim is easy to see. (The site also has a photo of a Red-bellied Black Snake with shredded neck scales as a result of excessive force being used to “pin” the snake with a stick, indicating lack of experience with venomous reptiles). McCarthy’s experience with venomous reptiles is as already inferred, limited at best, so it is a worry that he is actually teaching others about these reptiles. He apparently gets away with this by making false and misleading claims (generally unverifiable) about his experience with reptiles (claimed years in the reptile game or in the “snakehandler” business). While I have not been to one of his “courses”, several people who have, have been generally dissatisfied with them for various reasons. We even have statements from disgruntled customers detailing the various defects of the courses. However of greatest concern is that he is teaching people that it is acceptable to use tongs to handle and catch deadly snakes. I though this was unbelievable until on Thursday 5 October 2006, I happened to be at a park in Shepparton in rural Victoria, with my wife and children, when I saw a so-called “snakehandler” trained by “snakehandler” (Watharow/McCarthy) in Melbourne catch a Tiger Snake in front of about 50 by-standers. The snake was resting under a metal cylinder on an open concrete slab. To my way of thinking, capture would have been routine and easy by simply lifting the cylinder away, pinning then tailing the snake into a bag or container. The snake would have been “held” for mere seconds before being safely ensconced in a bag or box. What actually happened was horrific. I watched this man (previously unknown to me) lift the edge of the cylinder and use a pair of metallic cripple tongs to grab a part of the snake. The snake wrapped it’s forebody around the part of the cylinder on the ground in a final attempt to escape and the result was an effective stand off with neither party willing to give up. The man with the tongs then tightened the grip and pulled the snake backwards. At this point and as the snake also pulled forwards, the snake’s scales were ripped off and the tongs pulled scales and flesh over the tightly held ribcage to reveal the insides of the lower half of a gravid female Tiger Snake. Flesh, blood, internal organs and broken bones were there for all to see. The comment was made “better the snake end up dying, rather than me”. The same comment had been made to me by Simon Watharow in different but similar circumstances a few years earlier. However my view is that there never needed to be such a trade-off in the circumstances just described. Not only did the Shepparton “snakehandler” kill an adult Tiger Snake, but he also wiped out it’s developing litter of young. Another man present mentioned that it was no great loss “as there are millions around here”, but suffice to say that wasn’t my view, even if the man was right about the snake numbers. Since then I’ve seen several other fatally injured snakes that have got their injuries from the use and misuse of tongs to attempt to catch them. Earlier in 2006, I saw a snake catcher in Melbourne attempt to use a set of tongs to grab a Tiger Snake in heavily vegetated ground. The tongs were cumbersome and he couldn’t get a grip on the fast moving snake. In the end and after watching the novice floundering with the now aggro snake for several minutes, I grabbed the tail end of the snake as it was about to go down a hole. The snake was in a plastic tub a few seconds later. That was one of the lucky ones as it was released shortly thereafter. That snake-handler said he was amazed that I took such risks actually grabbing a wild Tiger snake with my bare hands. To me this was simply routine and I never viewed myself as being at undue risk. Now there is always a possibility that at some stage in the future, humans may develop robots to pick up snakes, prosthetic hands or even tongs that are actually sensible and safe for the snake when used. However at this stage I have seen nothing remotely approaching these ideals and on that basis the use of tongs for catching wild snakes should be shunned. When catching wild snakes, once I have “tailed” the snake and it’s in their air, the game is effectively over as far as snake capture is concerned. I can wriggle it for hours if need be without being bitten. In real terms a bag or box is usually only a few seconds away and the final scene of the capture is a snake going head first into the receptacle and it closing shut behind the snake. In Victoria and elsewhere, snakes are supposedly “protected”. This means it is illegal to kill them. They are also covered by cruelty to animals laws and various other codes of ethics, some of which are legally binding. On this basis, the use of tongs must be illegal in every state of Australia. I am sure that the same legal situation would exist in most if not all parts of the USA. While this is obvious to anyone who sees the tongs in use against wild snakes, for reasons unknown to me, wildlife authorities in the Australian states of Victoria and Queensland have up to the present time apparently ignored this situation. For the benefit of readers, the “Prevention of Cruelty to Animals Act 1986” in Victoria, Sections 9 (1)a effectively outlaws the use of Tongs that cause undue pain, suffering or injury to snakes where more humane alternatives exist. “A person who does or omits to do an act with the result that unreasonable pain or suffering is caused, or is likely to be caused, to an animal commits an act of cruelty upon that animal and is guilty of an offence. Penalty: 60 penalty units or imprisonment for 6 months. 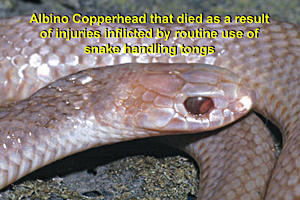 The important text here being “is likely to be caused”, in that if a person claims to have used tongs to handle a snake, but actually avoided injuring it, the mere fact that they put the snake at undue risk of injury makes the act of using the tongs illegal. This is the same sort of law that makes driving too fast illegal. Not all fast driving causes crashes, but it is outlawed due to the increased risks. In North America and elsewhere, where tongs are sometimes used to handle thick-set snakes like Rattlers, the snakes most of the time do in fact tolerate the handling and don’t tend to struggle. However if and when a snake decides to struggle, either injury or failure to restrain the snake are the ultimate result. Here in Australia, I have (as part of a series of tests) moved well-adjusted Death Adders from tank to tank with the use of BBQ tongs and also tongs marketed for snake handling. However these were snakes that didn’t want to struggle. If they did, they’d be dropped rather than risk being injured by a tightened grip. In my view, for thick-set snakes, wild ones are best caught with a pinning device, then using a second one, pinned by the head. Then the snake may be picked up by the neck (behind head), with the full body weight supported by other hand, before being released into an appropriate bag, box or whatever. Placid specimens, including captives may be moved around with appropriate hooks (that they will tend to sit on) and this is the preferred means to move captive Death Adders in Australia. I mention this only in as much as these snakes most resemble the North American crotalids in terms of their physique. In terms of the degree of stress caused to a snake by the use of “tools”, the general order runs, hooks (least), pinning sticks, then tongs (most), with a general allowance for variations in designs and materials used. Obviously hands generally cause less stress to snakes than any of these, but the safety issue of free-handling generally negates this possibility for wild deadly snakes. No tongs marketed yet have anything approaching the dexterity of hands and unless and until such a device is made, my view is that tongs shouldn’t be used to handle snakes or ever be marketed as a substitute for a hand. Frankly, the risk of injury to the snake is far too high. If a person is too afraid to use their hand to pick up a wild snake after pinning it (or as it flees via a place that prevents it from double-backing and biting), they should not be allowed to use tongs as a substitute for a pinning stick or similar. Instead these people should change their job! By the way, stress in a snake is easily measured, and most often in the context of handling in the propensity to bite. Tong handled snakes routinely try to bite. This is the ultimate sign of pain. Pinned snakes do as well, but not quite as much. Hooked snakes as a rule generally don’t rush to bite. Pain and stress in a snake is definitely measurable by the propensity to bite (after excluding other variables). At our facility in Australia, most snakes (including the Death Adders) have been venomoid for some years. All these venomoids are free-handled daily and none of the venomoids are ever exposed to any kind of handling implement. None are even hooked! All cause stress to the snakes far greater than by any “free handling” and we prefer the snakes to be as stress-free as possible. The removal of stress and pain in these snakes is measurable by the fact that the free-handled snakes almost immediately lose any urge to thrash, flee, bite or any other signs of pain, discomfort or fear. This includes for the most fearsome and “aggressive” taxa such as supposedly intractable eastern Brown Snakes, Coastal and Inland Taipans, Tiger Snakes, Death Adders and so on. (For the record, routinely free-handled, elapids, including the previously named taxa are less likely to bite (per hour of handling) than similarly handled pythons, although for both groups the bites incurred in captivity are mostly “feeding bites”). Early in 2007, I approached the governments in both Queensland and Victoria to specifically outlaw the use of tongs for the purposes of attempting to catch deadly snakes. The basis of the approach was simple. The inherent risk of injury to the snake. As it happens, I also believe that they are an inferior capture method for local Australian elapids, than the use of pinning stick and/or hand/s. Months after raising this issue with officers of DSE, they have not apparently done anything to stop this practice. I am sure that other persons with concern for reptiles and their welfare will agree with my stand. Just as I copped a lot of flack from people in the 1980’s when I fought for the right of private individuals to keep reptiles, I expect flak for my stand against the use of tongs to catch and handle snakes. However just as time found me to be correct in my views on private keeping of reptiles, so too I think time will find my views on tongs as used at the present time to be correct. This is not surprising, as persons guilty of crimes have an obvious interest in removing the publicly available evidence of it. This is a common problem seen when citing internet references and the ease with which website managers and controllers can edit and delete material on these sites. Prior to the submission of the paper above (and as routine procedure for Raymond Hoser), the cited internet material, had been downloaded and saved to disk in the original unedited form, for the specific purposes of verification and proof. Hoser, R. T. 2001. Pailsus - a story of herpetology, science, politics, pseudoscience, more politics and scientific fraud. Crocodilian - Journal of the Victorian Association of Amateur Herpetologists, 2(10):18-31. A similar paper to this one condemning the use of tongs to harm and mutilate wild snakes was published in Crocodilian - Journal of the Victorian Association of Amateur Herpetologists 7(1), pp. 21-24 in August 2007, under the heading: "Call to outlaw the use of tongs for catching and handling deadly snakes". Snake Man®, Snakebusters®, Reptile Party®, Reptile Parties®, and trading phrases including: Australia's BEST reptiles®, Hands on reptiles®, Hold the Animals®, and variants are registered trademarks owned by Snake Man Raymond Hoser, for which unauthorised use is not allowed. Snakebusters is independently rated Australia's BEST in the following areas of their reptile education business.